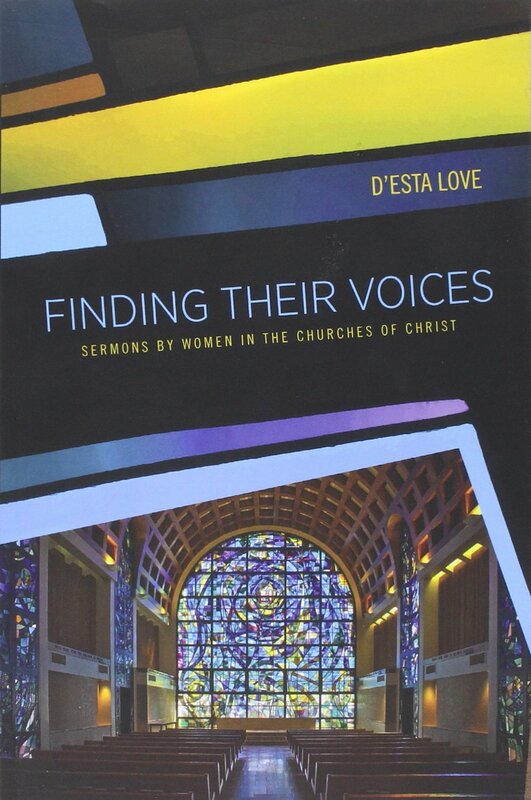 D’Esta Love is no stranger to writing and editing; as co-editor of the Pepperdine University based ministry journal, Leaven, she has often encouraged the ministry of other women.1 She is also no stranger to “finding her voice.” In the introduction to Finding Their Voices, Love reflects on the number of years she waited for the opportunity to preach in her own heritage, in a Church of Christ (she was seventy years old). Because opportunities for women to preach in conservative churches remain infrequent, Love has collected these sermons as a way to “document that history as well as preserve their words” (25). The preservation of that history is important for this particular fellowship of churches. Love recalls one historian, Kathy Pulley of Southwest Missouri State University, who spoke on the history of female preachers in the early Stone-Campbell movement (the movement of which the Churches of Christ are a significant part).2 While much is known about their lives, none of their sermons were preserved. Love’s compendium is not only a historic record of change in the Churches of Christ, it also preserves the words of the women themselves. But this significance is not limited to one fellowship of churches. It is also notable because the voices of women are an alternate (and often undervalued) source of biblical interpretation. Another author, Anna Carter Florence, discusses the importance of women hearing and proclaiming “a different and liberating word . . . in the context of their own experience as women.”3 Love’s collection has merit and application for all who study God’s word and value a variety of voices. Those whose voices have ever been silenced will keenly appreciate Love’s volume. This was an extremely personal book for me; I was alternately sad and hopeful as I encountered evocative comments such as, “this son who would walk in his footsteps . . . was his daughter” (17), “an older woman . . . struggling with the silence imposed on her for decades” (19), “if you had told me 20 years ago I would be preaching I wouldn’t have believed you” (170), and “asking why I had been given a voice in a silent tradition” (199). The book is not an academic analysis of preaching, and I encourage readers to read the sermons together with their prefaces and biographies in order to connect with the people whose stories they tell. The sermons are from a variety of contexts. The twenty-nine preachers include two sisters who are college professors (31, 37), a church planter from Texas (57), college or seminary students who preached in class or chapel services (73, 81, 161, 169), and a hospital chaplain (89). Some women found audience outside their own tradition when their own did not invite them to preach (105, 121, 191). Each woman trusted God enough to “witness to the truth of Jesus Christ as they have seen and believed it.”4 Each woman accepts the gravity and integrity of the word of God, and each woman embraces the responsibility of proclaiming that word to her community. One theme throughout the book is the importance of change. The forward, written by Richard Hughes of Messiah College, affirms that current changes regarding women in ministry are biblical (18). Contributor Charme Robarts suggests that patiently waiting for others to change is important to our witness; like a seed growing in the ground, unseen change and growth may be happening (125). Jo-Anne Fleming, another contributor, reflects on her own congregation’s experience, noting that, after fifteen years of discussing the issue, it was important actually to change their practice by having women “courageously [participate] in the worship service” (130). Love’s aim is not only to “encourage women to develop and use their gifts,” but also to empower leaders to open doors to women who are finding their voices (28). While academic resources provide biblical support for women who preach, it may be their stories and sermons which serve as a catalyst for change. One author reminds of the importance to hear all voices which “together create a more complete story and a better sense of the whole of the church.”7 Ministry leaders and seminary students, both men and women, will benefit from hearing the voices of these women. Love’s legacy is empowering women to tell their stories in a way that connects them to God’s greater story. Let anyone with ears listen! 152–56; “Does All Flesh Mean Me?” Leaven 16, no. 1 (2008): 24–26; “Why Am I Afraid?” Leaven 4, no. 2 (1996): 4–6; and the entirety of the following issues of Leaven: 16, no. 1 (2008); 20, no. 2 (2012); 22, no. 2 (2014). Leaven is available online at http://digitalcommons.pepperdine.edu/leaven/. 2. Love recalls this conversation in Finding Their Voices, 24. 3. Anna Carter Florence, Preaching as Testimony (Louisville: Westminster John Knox, 2007), xix. 4. Florence, Preaching as Testimony, xix. 5. D’Esta Love, quoting Tiffany Dahlman, Finding Their Voices, 28. As a postscript to that quotation, Tiffany has recently begun pastoring a small house church; she is indeed finding her voice. 6. 1 Pet 3:15 and 2 Tim 4:2, respectively. 7. Patricia Magness, “God Speaks My Language,” Leaven 22, no. 2 (2014): 67.